Extranodal tuberculosis (TB) of the head-and-neck area is a rare clinical entity and constitutes the less common type of extrapulmonary TB. It often creates challenges among head-and-neck physicians for its diagnosis and treatment. Extranodal TB is a rare clinical entity and has no specific clinical features. It is often a differential diagnosis of head-and-neck malignancies, chronic infective or noninfective ulcers. Early diagnosis and its treatment may avoid complications and needless major surgery. The purpose of this review article is to discuss the epidemiology, pathophysiology, clinical presentations, diagnostic challenges, and treatment of the extranodal TB of the head-and-neck area. Tuberculosis (TB) is a major health problem in developing countries. TB is a chronic granulomatous infectious disease of the human being caused by intracellular acid-fast bacilli Mycobacterium tuberculosis known since antiquity. Although there is a tremendous advancement in the treatment and prevention of the TB, still it is a major cause of disability and death in developing and underdeveloped countries. TB has a worldwide presence, and no part of the human organ is immune to it, and the most common primary site being involved is lungs. Lymph nodes are the most common location in the head-and-neck area to be affected. Although extranodal part of the head-and-neck area is rare but often delayed and misdiagnosed in clinical practice. The clinical presentations, endoscopy, and imaging are not enough for proper diagnosis. It often creates misdiagnosis with head-and-neck malignancies and other chronic infective and noninfective lesions. The aim of this review article is to discuss the epidemiology, pathophysiology, clinical presentations, diagnostic problems, and treatment of the extranodal TB in the head and neck region. The prevalence of TB is high in underdeveloped and some developing countries of the world. The World Health Organization (WHO) statistical information system documented that India has the largest TB patients in the world where the incidence of 168/100,000 (approximately 42 times the incidence of North America where it is 4/100,000). Extrapulmonary TB is a major type (approximately 25%) where 10%–35% are seen in the head-and-neck region. The concomitant human immunodeficiency virus (HIV) along with TB is 8.8%, and it increases the mortality of the disease by 33%. TB is one of the most devastating bacterial diseases of the human being and caused by M. tuberculosis. There are 8.7 million new cases of TB and 1.4 million people died from TB. This chronic granulomatous infection can affect any organ of the body. Due to advancement in the anti-tubercular therapy (ATT), the incidence is decreasing significantly. However, there is a resurgence of extrapulmonary TB including the tubercular lesions of the head and neck. This may be due to human immunodeficiency virus. Primary tubercular lesions in the oral cavity and oropharynx are rare, whereas the secondary infection following pulmonary TB may affect the tonsils and often present with unilateral tonsillar enlargement. It may affect tonsils through infected sputum or endogenous route (hematogenous route) affecting the germinal centers and presents with bilateral tonsillar enlargement. These manifestations may be associated with hypopharyngeal or laryngeal tubercular foci, particularly in miliary TB. Isolated laryngeal TB is rare and occurs due to direct infections by aerosolized particles. Secondary involvement of larynx occurs by cough and expectoration from tracheobronchial tree or through bloodstream from other than lungs. Lymphatic spread to the larynx is rare. Laryngeal TB has no gender or age predilection, but in pediatric age, laryngeal TB may not reveal abnormality in chest X-ray. Malignancy like squamous cell carcinoma and TB may coexist in the same patient, so biopsy is essential in this patient. Pulmonary TB with scar tissue in the lungs may cause traction neuropathy by affecting the recurrent laryngeal nerve and leading to vocal cord palsy. 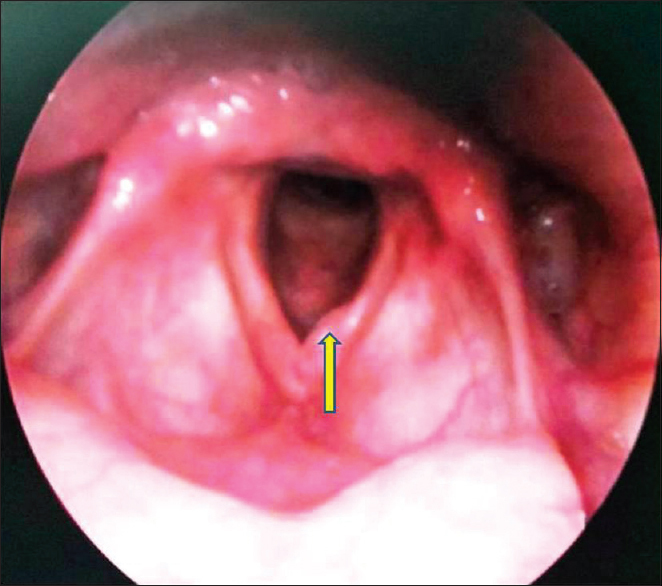 Laryngeal sites affected by TB are in the decreasing orders as follows: true vocal folds (50%–70%), false cords (40%–50%), epiglottis, aryepiglottic folds, arytenoids, posterior commissure, and/or subglottis (10%–15%). TB of the sinonasal area is often secondary to pulmonary TB. However, the primary sinonasal TB is rising in present days. The pathological changes of sinonasal TB are often three types. The infection is confined to mucosa of the sinonasal area and leads to polyp formation. The second type affects the bony wall and often leads to fistula formation. The third type is associated with hyperplastic changes in the sinonasal mucosa and leads to the formation of the tuberculoma. Sinonasal TB often leads to complications of septal perforation, nasal stenosis, or atrophic rhinitis if not treated in time. TB of the thyroid gland is a rare occurrence. It may occur due to hematogenous spread, lymphatic spread, spread from adjacent larynx, and lymph nodes of the neck. TB of the thyroid gland is rare as it is covered by a tough capsule which protect it from infection and high iodine content in the thyroid gland acts as a natural antiseptic. High blood flow to the thyroid gland prevents tubercular infection by formation of its nidus formation and destroying tubercular bacilli by increased phagocytic activity. TB of the salivary gland is rare infection. The tubercular infection spread to the salivary glands through transoral spread via salivary ducts, hematogenous spread and lymphatic spread from the tonsils or from the external auditory canal directly. The involvement of spine in the neck is often through hematogenous spread from primary site through small end arteries near to the vertebral endplate. The formation of abscess in this region may lead to neural compression. It occurs secondary to lymphatic involvement and often due to acute tubercular pharyngitis or mastoiditis or TB of cervical spine or cervical lymph nodes. Nasopharynx is one of the common sites in head-and-neck region to be affected by the TB. These are (1) airway, either through direct nasal ventilation or secondarily by canalized bacillary expectoration; (2) hematogenous or lymphatic channel, from primary location, usually from pulmonary. The lymphatic nasopharyngeal contamination is better explained by the profuse lymphatic network of the Waldeyer ring. The clinical presentations of the extranodal TB in the head-and-neck region are often nonspecific and create confusion among clinician. In sinonasal TB, patients present with nasal discharge, nasal obstruction, and mild swelling of cheek and orbit. The primary sinonasal TB is rare clinical entity which often mimic with other types of rhinosinusitis, so frequently missed by clinician, delay in diagnosis and its treatment. TB of the oral cavity and oropharynx is often rare. TB of the tonsils usually presents with sore throat and odynophagia. TB of the tonsil is suspected when there are unequal sizes of the two tonsils and often associated with jugulodigastric node enlargement. The predisposing factors for the primary TB of the oral cavity are HIV infection, poor dental hygiene, alcoholism, dental extraction, periodontitis, and leukoplakia. The clinical presentations of the tonsillar TB often mimic to traumatic ulcers, aphthous ulcers, syphilis, actinomycosis, malignancy, midline granuloma, hematological disorders, actinomycosis, and Wegner's granuloma. TB of the otitis media is a rare clinical entity in the human being. It constitutes 0.04%–0.90% of all types of suppurative otitis media in developed countries, whereas its incidence is steadily rising in the endemic areas of the TB. Tuberculous otitis media is characterized by painless ear discharge of insidious onset which fails to respond with antibiotic treatment, single or multiple perforations in the tympanic membrane, pale granulation tissue inside the middle ear cavity, and mastoid and hearing loss out of proportion to clinical findings. Profound hearing loss is often seen in tuberculous otitis media which may be conductive, sensorineural, or mixed type depending the extent of the disease-causing tympanic, ossicular, or bony destruction. Single perforation is often seen than multiple perforation in the ear drum. The pale, polypoidal, and edematous granulations are seen in the middle ear cleft. In nasopharyngeal TB, patients present with chronic nasal obstruction, blood-stained nasal discharge, and postnasal drip. The other clinical presentations in nasopharyngeal TB are rhinorrhea, epistaxis, cervical lymphadenopathy, serous otitis media, and hearing loss. In nasopharyngeal TB, the diagnostic nasal endoscopy may show bulged and irregular mucosa at the posterosuperior part of the nasopharynx. The parotid gland is the most common salivary gland to be affected by TB. In cases of parotid gland TB, patient presents with swelling of the infra-aural area where the examination confirmed a mass of the parotid gland may be associated facial weakness. TB of the parotid gland often presents with unilateral swelling or abscess formation in the parenchyma of the gland. The fistula formation in the parotid gland often suggests the diagnosis. The clinical presentations of the parotid gland TB may mimic to neoplastic lesions of the parotid and sarcoidosis. Thyroid gland TB often presents with thyroid nodule or as multinodular goiter. Sometimes, it forms fistula with its orifice. Hence, the diagnosis of the thyroid TB is suspected when goiter occurs in context to TB or immunosuppression. The laryngeal TB often presents with hoarseness of voice (80%–100%) and odynophagia (50%–67%). It can affect any parts of the larynx. The vocal cords of the larynx are commonly affected in the laryngeal TB. The laryngeal TB is characterized by edema, hyperemia, or ulcerative lesions in the larynx [Figure 1]. The difference between laryngeal carcinoma and laryngeal TB is often difficult. Previously, laryngeal TB is due to complications of pulmonary TB, but in present time, isolated laryngeal TB is increasing. Hence, Otorhinolaryngologists and head-and-neck physicians should be alert regarding its varied clinical presentations and diagnostic challenges for early treatment and to avoid its complications. The diagnosis of extranodal TB is based on pathological and microbiological findings of the biopsy specimen collected from the different locations of tubercular lesions. Diagnosis is often confirmed by histopathological examinations with chronic granulomatous inflammatory exudates with or without caseating necrosis. In some cases of histopathology picture showing the absence of caseations, the diagnosis is confirmed by recovery of the patients under ATT. Routine blood investigations such as total white cell counts, differential count, and erythrocyte sedimentation rate are done in all cases. Tuberculin test is also advised in all cases. Clinical presentations and imaging are nonspecific and often mislead to diagnosis. Diagnosis is mainly based on the histopathological examination. Biopsy and histopathological examinations are usually done in all cases of head-and-neck extranodal TB for confirmation. Early diagnosis by fine-needle aspiration will avoid major surgery of the neck lesions such as parotid gland TB as it is a medically treatable lesion. The histopathological examination reveals granulomatous inflammation with epithelioid giant cells and caseous necrosis [Figure 2]a. Ziehl–Neelsen staining may directly show acid-fast bacilli [Figure 2]b. The microbiological culture and drug sensitivities of the infective strain are not usually done in practice, whereas the multiple repeated biopsies are often used for confirming the diagnosis and starting the treatment. The polymerase chain reaction (PCR) test is often used for diagnosis of TB. The detection of M. tuberculosis is increased from 2% to 17% on culture to 89%–100% in PCR. In cases of strong clinician suspicion of TB with negative cultures, samples can be sent for PCR test. Diagnostic nasal endoscopy shows mucosal thickening, ulcerations [Figure 3], or polypoidal mass. Parotid gland TB is often diagnosed by fine-needle cytology. Thyroid gland TB constitutes 0.1%–0.4% of all types of TB affecting the body parts. In thyroid gland TB, fine-needle aspiration cytology often confirms the diagnosis and helps to avoid thyroidectomy. Radiological tests or imaging are important supportive investigations in extranodal TB. Ultrasound of neck is helpful in case of TB of thyroid and parotid gland. Computed tomography (CT) is helpful in sinonasal [Figure 4] and nasopharyngeal TB [Figure 5] for identifying the site of lesions. Magnetic resonance imaging (MRI) can be done in parotid and laryngeal TB. Chest X-ray of lungs is advised in all cases to rule out pulmonary TB. CT scan is advised to show either a large mass, a lobulated mass, or irregular soft tissue in the head-and-neck region. MRI is useful in case of soft granulomatous mass. In nasopharyngeal TB, MRI helps to discriminate as polypoid mass of the adenoids or diffuse thickening of the mucosa at the nasopharynx. 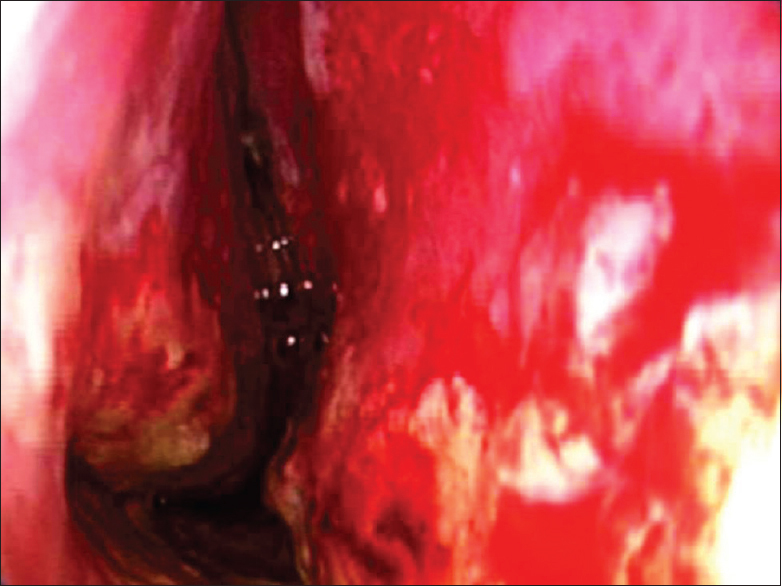 The tubercular lesions present as a diffuse thickening of the oropharyngeal walls in postcontrast enhancement. CT or MRI shows to multiloculated fluid collections in the tonsils or floor of the mouth or peritonsillar region as abscess formation. There is diffuse thickening of the laryngeal surface with or without any mass in the acute stage of laryngeal TB. In chronic stage of laryngeal TB, granulomatous lesions seen as mass in the imaging. There are four patterns of laryngeal TB in the imaging. These are superficial ulcerative lesions, mucosal thickening, polypoidal masses, and fungative lesions. In the larynx, TB is differentiated from the squamous cell carcinoma by criteria such as (1) no destruction or sclerosis of cartilages, (2) no disruption of laryngeal architecture; (3) TB rarely affects the subglottis or hypopharynx; (4) TB affects cricoarytenoid joint causing fixation and laryngeal stenosis; (5) vocal cord mobility is less commonly impaired in tubercular laryngitis. 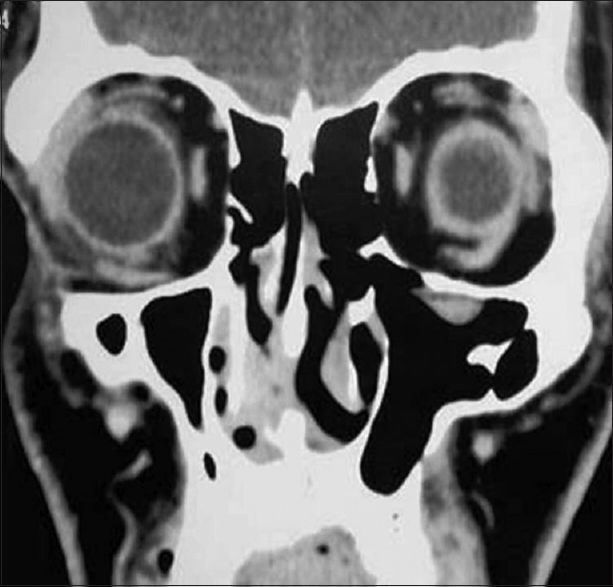 The imaging patterns in sinonasal TB are Stage 1: soft-tissue nodules in the nasal cavity or periosteal thickening in paranasal sinus; Stage 2: bony destruction with soft-tissue mass; and Stage 3: calcification inside the nasal mass. In case of tuberculosis of thyroid gland, ultrasonography and CT scan demonstrate small multiple focal lesions which mimics with miliary tuberculosis. Caseating granuloma in the thyroid gland may cause swelling of the gland and lead to cold abscess with or without abscess. In ultrasonography, there are two types of findings seen in the salivary glands. These are diffuse pattern where gland enlarged, hypoechoic gland has heterogeneous echo pattern with the presence or absence of intraglandular anechoic foci. In the second type, focal hypoechoic nodules are seen are around the periphery of the gland. 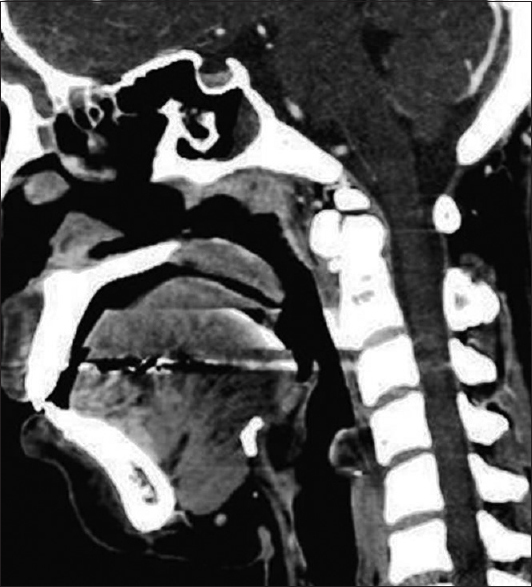 CT or MRI shows diffuse enlargement of the glands with central necrosis and peripheral enhancement or abscess formation. The goal of the treatment in the extranodal TB of head-and-neck region is to cure the patient and prevent transmission of the disease. All the cases of extranodal TB in the head-and-neck region need antitubercular treatment. Four drugs such as rifampicin, isoniazid, ethambutol, and pyrazinamide are given in the intensive phase for 2 months followed by isoniazid and rifampicin in a continuation phase for 6–8 months. As per the WHO guidelines, the extrapulmonary TB should be treated by four-drug regimen in first 2 months followed by two drugs for next 4 months. The combination treatment is often used at present time and useful for the general population and constitutes isoniazid, rifampicin, and pyrazinamide for 2 months followed by 4 months more of isoniazid and rifampicin. However, in drug-resistant M. tuberculosis, immunocompromised patients with miliary TB, these protocol are not appropriate. There are some other medications are added in resistant cases. Although main treatment of extrapulmonary TB is antituberculous therapy, the surgery is often done to establish an early diagnosis and start early treatment of the patient. The absence of characteristic clinical presentations and rare occurrence of the head-and-neck extranodal TB often create challenges among physicians and may lead to misdiagnosis and delayed treatment. Sinonasal TB often needs endoscopic sinus surgery. Tonsillectomy is done in tonsillar TB and salivary gland TB may need superficial parotidectomy, whereas thyroidectomy is needed in thyroid TB before getting diagnosis. The report showed epithelioid granuloma with or without caseating necrosis. Surgery is often advised in primary aural TB for preventing facial nerve palsy and intracranial spread although in the present day the ATT is the paramount in managing aural TB like pulmonary. Extranodal TB of the head-and-neck region is rare occurrence and often leads to misdiagnosis of the disease. The diagnosis is often surprise during the management of head and neck lesions. Histopathological confirmation is the most important in the diagnostic procedure for these lesions. Antitubercular treatment is the treatment of choice for extranodal TB of head and neck region. Early diagnosis and its treatment may avoid complications of extranodal TB and needless major surgery. Zhao D, Yang XM, Chen QY, Zhang XS, Guo CJ, Che XY, et al. A modified acid-fast staining method for rapid detection of Mycobacterium tuberculosis. J Microbiol Methods 2012;91:128-32. World Health Organization. Epidemiology: Global Tuberculosis Control: Epidemiology, Strategy, Financing. Geneva: World Health Organization; 2009. p. 6-33. Available from: http://www.who.int/entity/tb/publications/global_report/2009/pdf/chapter1.pdf. [Last accessed on 2009 Nov 12]. WHO Report 2008: Global Tuberculosis Control Surveillance, Planning, Financing. Core Health Indicators. Available from: http://www.who.int/tb/publications/globalreport/2008/pdf/fullreport.pdf. [Last accessed on 2009 Mar 05]. Menon K, Bem C, Gouldesbrough D, Strachan DR. A clinical review of 128 cases of head and neck tuberculosis presenting over a 10-year period in Bradford, UK. J Laryngol Otol 2007;121:362-8. Vaid S, Lee YY, Rawat S, Luthra A, Shah D, Ahuja AT, et al. Tuberculosis in the head and neck – A forgotten differential diagnosis. Clin Radiol 2010;65:73-81. World Health Organization. Global Tuberculosis Control. Geneva, Switzerland: WHO Report; 2012. Abid W, Gamra OB, Ghorbal H, Beji I, Zribi S, Hriga I, Mbarek C. Extra nodal ENT tuberculosis. Egypt J Ear Nose Throat Allied Sci 2014;15:279-82. Park KH, Park SI. Concurrent tuberculosis of the larynx and the tonsil. Yonsei Med J 1988;29:79-83. Sá LC, Meirelles RC, Atherino CC, Fernandes JR, Ferraz FR. Laryngo-pharyngeal tuberculosis. Braz J Otorhinolaryngol 2007;73:862-6. Singh K, Kaur G, Parmar TL. Pseudo tumoral laryngeal tuberculosis. Indian Pediatr 2003;40:49-52. Unal M, Vayisoglu Y, Guner N, Karabacak T. Tuberculosis of the aryepiglottic fold and sinus pyriformis: A rare entity. Mt Sinai J Med 2006;73:806-9. Lam PK, Wei WI. Medialisation thyroplasty for unilateral vocal fold paralysis associated with chronic pulmonary tuberculosis. Hong Kong Med J 2007;13:327-9. Swain SK, Behera IC, Sahu MC. Primary sinonasal tuberculosis: Our experiences in a tertiary care hospital of Eastern India. Egypt J Ear Nose Throat Allied Sci 2017;18:237-40. Kakeri AR, Patel AF, Walikar BN, Watwe MV, Rashinkar SM. A case of Tuberculosis of maxillary sinus. Al Ameen J Med Sci 2008;1:139-41. Puri MM, Dougall P, Arora VK. A case of tuberculosis of the thyroid gland. Med J Malaysia 2002;57:237-9. Seeley M, Waterhouse D, Shetty S, Gathercole J, Seeley C. Two cases of parotid tuberculosis. N Z Med J 2007;120:U2869. Ahsan H, Qazi MH, Westesson PL. Neuroradiology Case of the Week, Case 117. Radiology home page. Available from: http://www.urmc.rochester.edu/smd/Rad/neurocases/Neurocase117.htm. [Last accessed on 2009 Mar 05]. Kim KS. Primary nasopharyngeal tuberculosis mimicking carcinoma: A potentially false-positive PET/CT finding. Clin Nucl Med 2010;35:346-8. 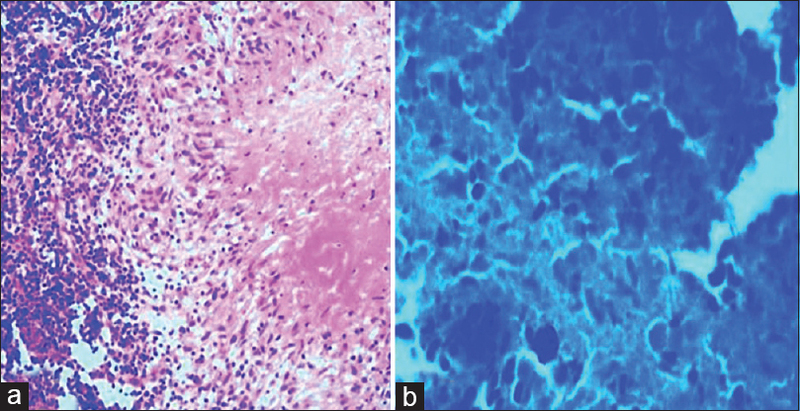 Prasad P, Bhardwaj M. Primary tuberculosis of tonsils: A case report. Case Rep Med 2012;2012:120382. Smulders YE, De Bondt BJ, Lacko M, Hodge JA, Kross KW. Laryngeal tuberculosis presenting as a supraglottic carcinoma: A case report and review of the literature. J Med Case Rep 2009;3:9288. Golden MP, Vikram HR. Extrapulmonary tuberculosis: An overview. Am Fam Physician 2005;72:1761-8. Dienye PO, Ndukwu GU. Tuberculous otitis media in an adult in a primary care setting: A case report. Asian Pac J Trop Med 2010;3:754-6. Kim CW, Jin JW, Rho YS. Tuberculous otitis media developing as a complication of tympanostomy tube insertion. Eur Arch Otorhinolaryngol 2007;264:227-30. Bhalla RK, Jones TM, Rothburn MM, Swift AC. Tuberculous otitis media – A diagnostic dilemma. Auris Nasus Larynx 2001;28:241-3. Lmekki S, Lecanu JB. Tuberculosis of the middle ear and nasal passage: A case report. Int J Mycobacteriol 2013;2:51-3. Civelek S, Sayin I, Ercan I, Caker BO, Turgut S, Basak T. Nasopharyngeal tuberculosis: A case report. Turk Arch Otolaryngol 2008;46:53-7. Gassab E, Kedous S, Berkaoui A, Sayeh N, Harrathi K, Koubaa J, et al. Tuberculose extra ganglionnaire de la tête et du cou. Journal Tunisien d'ORL et de Chirurgie Cervico-Faciale 2010;24:26-30. El Ayoubi A, Benhammou A, El Ayoubi F, El Fahssi A, Nitassi S, Kohen A, et al. Primary extranodal ENT tuberculosis. Ann Otolaryngol Chir Cervicofac 2009;126:208-15. Prstačć R, Jurlina M, Žižić-Mitrečić M, Janjanin S. Primary nasopharyngeal tuberculosis mimicking exacerbation of chronic rhinosinusitis. J Laryngol Otol 2011;125:747-9. Eguchi J, Ishihara K, Watanabe A, Fukumoto Y, Okuda K. PCR method is essential for detecting Mycobacterium tuberculosis in oral cavity samples. Oral Microbiol Immunol 2003;18:156-9. Garg R, Verma SK, Mehra S, Srivastawa AN. Parotid tuberculosis. Lung India 2010;27:253-5. Oudidi A, Cherkaoui A, Zaki Z, Hachimi H, El Alami MN. Thyroid tuberculosis. Ann Otolaryngol Chir Cervicofac 2005;122:150-3. King AD, Ahuja AT, Tse GM, van Hasselt AC, Chan AB. MR imaging features of nasopharyngeal tuberculosis: Report of three cases and literature review. AJNR Am J Neuroradiol 2003;24:279-82. Moon WK, Han MH, Chang KH, Kim HJ, Im JG, Yeon KM, et al. Laryngeal tuberculosis: CT findings. AJR Am J Roentgenol 1996;166:445-9. Darouassi Y, Chihani M, Elktaibi A, Touati MM, Nadour K, Benjelloun A, et al. Association of laryngeal and nasopharyngeal tuberculosis: A case report. J Med Case Rep 2015;9:2. Nakao Y, Shibata R, Murohara T, Tanigawa T. Primary nasopharyngeal tuberculosis: A case report. BMC Infect Dis 2016;16:121. World Health Organization. Treatment of tuberculosis: Guidelines. Global Tuberculosis Control. 4th ed. Geneva, Switzerland: World Health Organization; 2010. Small PM, Fujiwara PI. Management of tuberculosis in the United States. N Engl J Med 2001;345:189-200.